As a blogger, you know high quality, compelling images that relate to your topic are a key element to make your posts stand out and engage your readers (and if you don't, you're missing out!). Where to find photos for blog posts that are great, cheap and safe to use from a legal perspective, is the question that permanently spins around blogger's minds. And I have the perfect answer! I know what you’re thinking, “I can get photos for free”. Well, while this is true, it’s also a very dangerous practice for your blog. Free photo sites that let you download and use images free of charge and with little restrictions appear to be a God-sent solution, but they in fact hide considerable legal risks for any blogger using them. Now you must be guessing I’ll suggest using stock photo agencies, right? But in this case, they don’t quite cover all the bloggers needs. 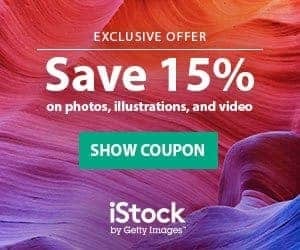 Sure a stock photo subscription will give you lots of images at very affordable rates, but that implies a monthly expense not all of you can sustain. And the agencies’ licensing terms often will not give you all the usage rights you require for your publishing activity. What I am bringing you today is a solution that covers all bases of using photos in online publications: PixelRockstar, the WordPress Photo Plugin I co-created. Our service not only solves the need for images for blog posts, having options for low budgets and granting the legal safety of their content, but also makes the process of using stock photos in WordPress platform faster and easier. Want to learn more? Visit PixelRockstar! Or stay with me, I’ll explain it all. You could end up having to pay thousands of dollars in compensation to authors. You didn't think it was that bad, eh? But sadly it is. The problem with most free photo sites is that they usually don't have/won't commit enough resources to image verification. Add to that the fact that many of them enable user submissions, and you have a considerable hidden legal risk. The reason is simple. Free photos still operate under a license, often a variant of Creative Commons license. These licenses do not require you to pay any fees for the image usage, but they're still the document that validates said usage. But (and this is a big but) image licenses are only legal as long as the one authorizing them is the copyright owner of the images. And if the site lets anyone upload images to be offered for free and they do not police the process, how can you know the licenses are valid? Stock photo agencies and paid photo services dedicate time, money and knowledgeable staff to review the photos they will offer to customers, granting all the legal permits are in order. They also punish fraudulent submissions and often times add a legal guarantee to their service, included in license terms. But free photo sites leave it up to you to do all the verifications to ensure whoever put a photo up for free download is actually the owner. This does not mean you cannot use their services, but that if you do, you definitely should invest time in verifying the legal status of the images yourself. For more in-depth info, read this great article on The Risks of using Free Photos in WordPress. And to learn how to be safe using free photo sites, check out this useful guide on How Not to Get Sued Using Free Photos from Web. Their services are not tailored for blog usage. Licensing terms don't always cover all blogging needs. We love stock photo agencies. They provide an affordable and simple way to get imagery for all kinds of purposes. However, when it comes to blogging, some of them miss out a bit. For one, the best and cheapest prices for images are those of high volume subscriptions, for 750 images a month or more. Sure it's great to have such a large number of downloads available, and if you can afford the $200+ a month it costs, you should definitely go for it. But how many of you bloggers out there can commit this amount every month just for photos? And how many of you really need almost a thousand images per month? Many agencies include lower-priced options, but this usually means the price per image is higher, and you get less for your money in the long run. And let's talk about licensing terms. Stock photo agencies sell Royalty Free licenses for their photos. 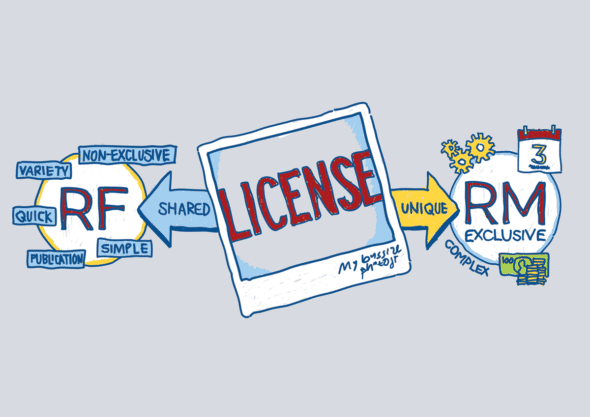 RF is a very flexible license that gives you a wide range of usage rights, including use in digital publications. However, many agencies do not fully cover specific points that are key to blogging. Use of images in social media is an important one: you want to be able to use the same photo from your article in your social media posts for greater coherence in promotion, but not all agencies allow you to use their photos this way. Finally, although stock photo agencies put a lot of effort in making their systems simple and quick for users to pay and download photos in seconds, when it comes to online publishing this only adds time and work to your process. You have to visit the site, search, pay, download the image… and then import it to your WP media library and insert it in the post. 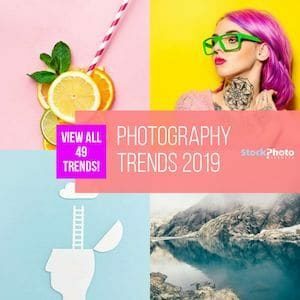 That's why, although still a remarkable service in cheap stock photos, the options of regular stock photo agencies might not be exactly what you are looking for when it comes to sourcing images for your blog. Again, this does not mean you cannot use their services, just that you need to make sure you understand their licensing terms and that you are abiding them in your usage, to avoid any license infringements and subsequent problems. Being aware of the hazard in free photo sites and knowing stock photo agencies don’t fully cover blogger needs for photos, me and my partners decided to take it upon ourselves to apply our industry expertise and provide a better , complete solution to using professional images in blogs. We aimed at simplifying every aspect of the issue, from image quality to affordability, from legal safety to workflow. And, if I can say so myself, we did it! 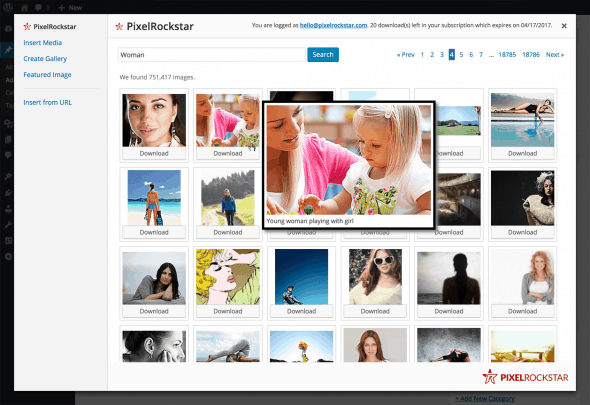 PixelRockstar is a stock photo plugin service that brings high quality, cheap stock photos to the number one platform for online publishing, WordPress. All of our photos are verified for technical quality and legality status, and they are safe to use in any publication you own directly. Our service integrates a library of over 4 million professional images right into your WordPress layout. This way, you can search, license and apply photos to your articles in a few simple clicks and without ever leaving your blog's interface. Launching directly from WordPress, all images you license are automatically added to your media library, including SEO-friendly tags! Goodbye to the hassle of finding and importing photos from other sites! And the benefits do not stop there. PixelRockstar's images come with our own Custom Digital License, specifically tailored for online publishing use. This license lets you use the photos in any online publication you own, including all supporting material for it: newsletters, email campaigns, social media posts, etc. The one thing to note is the license is Digital Use Only, and does not cover any kind of physical or print usage. Like this, you can get high quality imagery that is totally safe to use in your blog for as low as $0.57 per photo! Check their pricing here! If you run your blog on WordPress, this is by far the best solution around to get photos for your blog that are professional, legal, and cheap, and it also saves you time and effort in your publishing workflow. You can hardly ask for more! 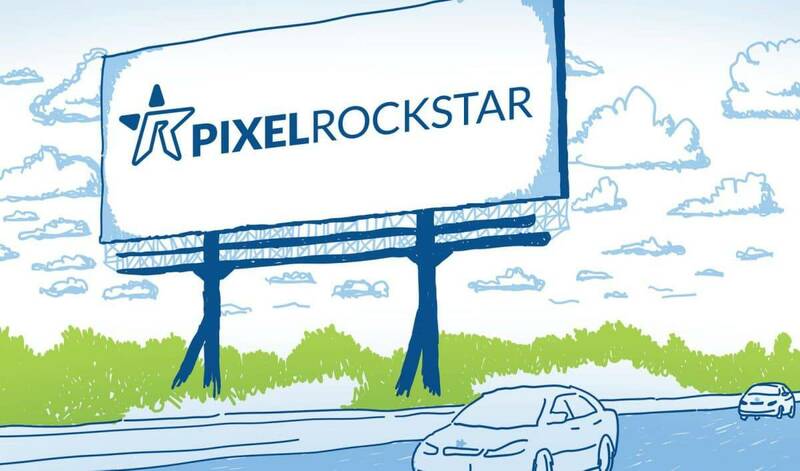 Check PixelRockstar service here! And feel free to drop a comment or contact me directly if you have any questions or comments! As you can see, the answer to where to find photos for your blog is more complex than just pointing in one direction. Your budget and your specific needs are to be considered. 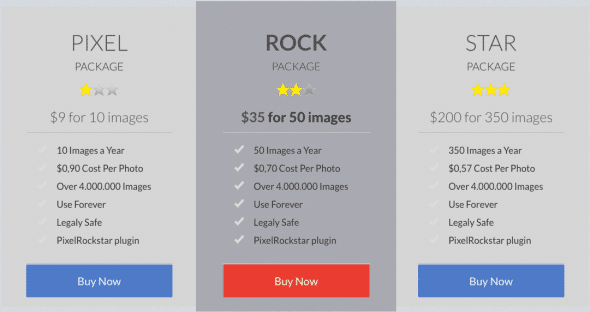 PixelRockstar is a cost-effective way to get photos for online publishing, as it's a complete service that is thought especially for blogging, and takes care of all important points. All you have to do is choose images, add them and post. 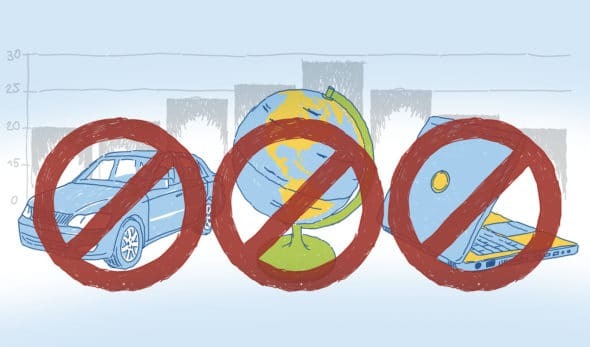 And if you are going for other options, remember the keys to use them safely. If choosing free photo sites, don't forget it's up to you to do the homework and track copyright owner and models to ensure the photo is legal and safe to use, because the source site won't do it for you. If going with a stock photo agency, always read their licensing terms carefully and make sure you are using the photos in an accepted way to avoid any trouble. Now that you are armed with knowledge and alternative, it's time to boost up your articles with great images!